Increased numbers of day visits, resilient domestic holiday market and an amazing range of world-class attractions. In a challenging external climate, England’s domestic tourism offer continues to generate billions in visitor spend and support millions of jobs. In 2016, visitor spend in England totalled £92bn accounting for over 80% of the visitor spend total for the UK, and 2.6m English jobs are supported by the tourism industry. 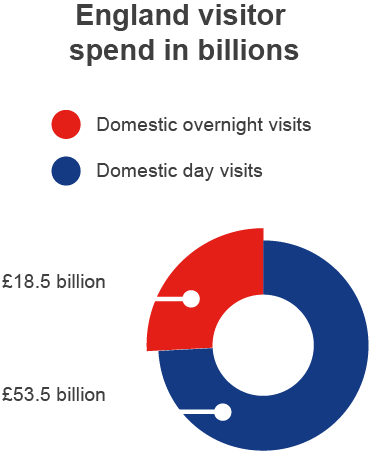 Domestic tourism in England is the key driver behind this, with domestic overnight and day visits together contributing £72bn, with 76% of domestic tourism expenditure taking place outside of London. This is the result of partnerships across a range of sectors (including sport, heritage, food, transport, business and the arts), changing consumer behaviours and the vibrancy and variety of England’s tourism products. In an external environment that continues to be challenging and volatile, domestic overnight visits have proved a solid and stable foundation for domestic tourism. 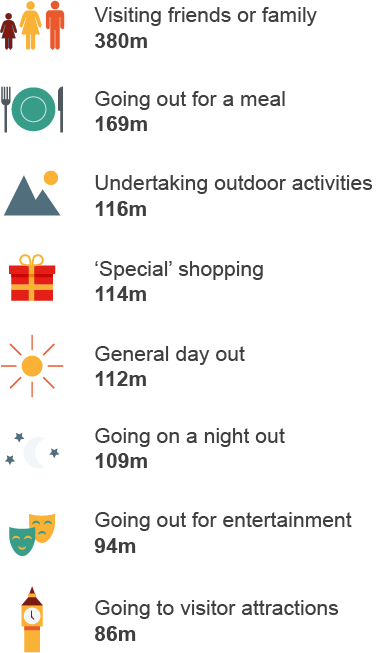 99m domestic overnight trips were taken in 2016 – generating a spend of £18.5bn. These figures represent a small decline year on year, driven primarily by a downturn in “VFR” travel (trips to visit friends and relatives). In contrast, domestic travel for both business and holiday purposes remained resilient, with trip volumes in line with the previous year. Specifically within domestic holidays, the number of longer trips (4+ nights) increased by 5% year on year, representing the best year on year growth for this sector of the market since 2009. In contrast, short breaks of 1-3 nights fell back by 2% year on year, though in historical terms the short break market remains strong, accounting for almost two-thirds of England’s domestic holidays by volume, with GB residents taking almost 4 million more short breaks in England than was the case a decade ago. In the first half of 2017, while overall trip numbers across are in line with 2016 (-1%), expenditure has risen by 7%. 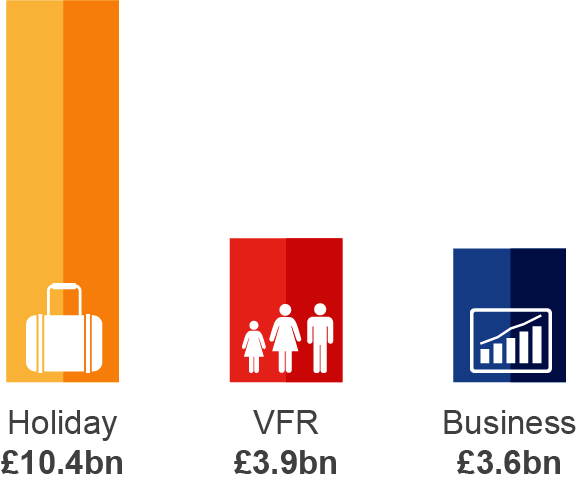 Like 2016, trends have varied by trip purpose, and while business and VFR travel have declined year on year, there has been an upturn in the holiday market, where both trip volumes (+7%) and expenditure (+17%) are at record levels for the January to June period, demonstrating that the certainty of budgeting for a holiday at home, the ease and convenience, are key contributing factors to Brits taking more domestic holidays and spreading the benefits of tourism across Britain. Day visits accrue benefits across the entire country as people take trips closer to home to visit the wide variety of stunning locations, attractions and events on offer throughout the year – spreading £53.5bn of visitor spend across all parts of the country in 2016. As such, in the challenging environment, domestic day visits continue to be a key driver of domestic tourism: with 1.6bn trips taken in 2016 (a 4% increase from 2015). Almost all regions of England saw an increase in the number of day visits in 2016. An amazing range of world-class attractions in England (from historic buildings to stunning gardens and internationally renowned museums) draw in millions of visitors every year. Our annual survey of visits to visitor attractions underlined the vital role attractions play in the visitor economy, with a 2% increase in visits from 2016, and attractions reporting a 7% rise in revenues. In the Year of the English Garden, the domestic campaign in 2016, we saw an 8% increase in visitors to garden attractions, with zoos (8%), historic houses / castles (7%) also benefitting from a continued growth in visits. "In a challenging external climate, England’s domestic tourism offer continues to generate billions in visitor spend and support millions of jobs."